Here is a link to Nicole's website/notebook/blog called 'The Pantry Book'. There is lots of good stuff on her site but of interest here is the Perone Mk2 hive started from small cell packages! (I know, it is not supposed to work from packages...prime swarms or amalgamated casts...as I keep postulating...but look for yourselves). It is a photographic record of the development of the colony from installation, the hive has two large perspex/plexiglass windows and great attempts are made at photographing the colony through these. For those interested in biome/climatic areas, I do not know for sure where this hive is but she does mention she is in MD which I believe is the State of Maryland, USA, so mid right, just under the 40 degree North latitude, so on the same latitude as parts of Portugal, Spain, toe of Italy, Greece, but looking at several biome maps gives it as temperate broad leaf forest. This is a great boost to the available information as still very little is coming out of S. America, in terms of photos or video despite having almost a full winter to get this information sorted and on the web, particularly with hives up and running for a number of years. Thanks for posting Andy, these are indeed fantastic photos. MD is Maryland, east coast of the US with hot and muggy summers. July average high temp is 87F/31C and the January average lows are 24F/-4C. Thanks for the climate information Trip, I always have to measure other places by what goes on here in the damp British Isles, with its cool temperate maritime climate that prolongs the winter into spring. Does this Eastern part of the USA get that abrupt continental type of change from winter to spring to summer that favours the early build up bee sub species or is it more prolonged like here? It seems to be a more abrupt and faster transition into spring and summer at least here in the Northeast portion of the east coast. We can go from snow on the ground to warm sunny days in a matter of a couple of weeks. Good find Andy, they look to have built up well. Some great photos on the blog. Ultimately, I built a 7 frame nuc box for the Perone hive, installed the package it, and the bees liked the smaller space and didn't leave. A month later, I moved these bars into the Perone. And because the Perone hive seemed oversized for the Italians, I did not install the honey supers...all was well. Until the split, the small hive beetles, and something else arrived. I was trying to be a good Perone hive keeper and stay out the brood box and missed the queen cell development, the growing small hive beetle population and whatever but ate some holes through the comb. At the height of my 2013 summer development, 1/3 of the Perone was filled with comb and bees, a month later I was down to a ball the size of a grapefruit. Going to be a dead hive for sure I thought. At this point, I started breaking the Perone hive rules. I treated for the SHB with roach poison tucked into corrugated plastic cards so bees couldn't get to the poison. And I started feeding 1:1 sugar water like there was no tomorrow. Closer to fall I fed 2:1. I fed until 10/31/13. In Dec, I put in 2 Honey B Healthy Pollen Patties for good measure. Now, in March 2014, bees were out collecting pollen from crocuses and whatever else is available...they lived...phew. My Perone is a little different in that I have a screened bottom board that I can cover in winter. My bars are also individually removable to meet local laws. The internal cover is made of thin plywood that I glued foam board insulation to the top of. I used a hole saw to cut a hole through the internal cover so that I can mason jar feed. I have a nuc coming this spring for another Perone hive and a package coming for a Kenyan TBH. Anyone else survive the winter...even if just barely like me? I haven't posted about it on my blog yet, but I wanted to let you know that my Perone hive did not survive the winter. I think it might be because the package bees were used to being fed and I didn't feed them. They died in early winter, actually, so they must not have had enough honey stored up after the nectar flow stopped in my area. I really don't know for sure, but my beekeeping mentor had just been out a few weeks before -- and we fed them some raw honey at that time, but I guess it was too late -- and he didn't see any evidence of mites or hive beetles or anything like that. Anyway, I am "first on the list" for a swarm from my beekeeping mentor. Hopefully we can put a swarm on all that beautiful comb that my bees worked so hard to build last year. Maybe once they have that much comb already built they will be able to put more of their energy into making honey and they will be able to make enough food to survive. Sorry to hear that, I have been following your progress since Andy posted your link. My hive and a NUC I made in late summer both died too. I am getting my bait hives ready and have high hopes for the coming year, that is if spring ever reaches us. Good luck getting a swarm, I have sworn off packages and it's a swarm or nothing for me this year. In a deadout you won't find too many mites. To find out if it was mites or something different, do the following. Take a good cup full of dead bees and sort them by their body size. The smallest bees go to the upmost row, the biggest bees to the lowest row. You end up with say five rows of dead bees. If the picture of this is like a upside down pyramide, the row with the smallest bees being the longest, the bees were damaged by varroa most likely. If the overall picture resembles a pyramide shape, the row with the bigger bees being the longest, mites weren't the problem. Good way to find out mite problems in a deadout. 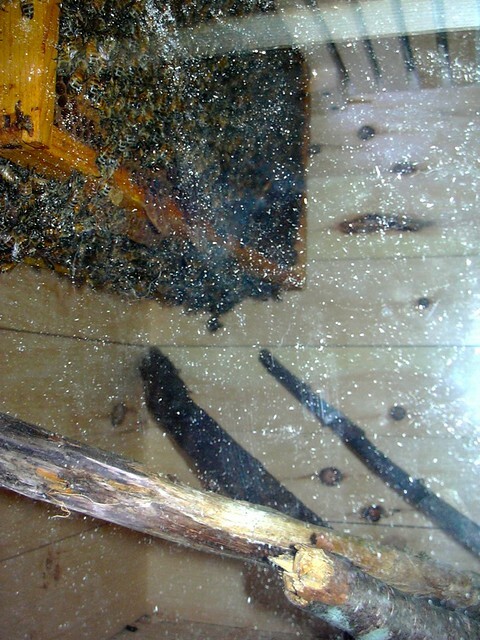 You also should check the ceiling of the cells, if there is whiteish stuff, this is varroa faeces. The more cells have it, the more mites the colony has had. Posted: Thu Apr 10, 2014 7:16 am Post subject: good to know! I didn't know that, so all the bees are gone now. Hopefully I'll never have another deadout, but I'll file this info away just in case. There are some cool pictures of the comb (looking up from the bottom) if anybody is interested. We are going to try again with a swarm this Spring. Thanks for all the interest and comments. sorry to hear your news. Better luck next time. I look forward to seeing your new photos. This means that currently, unless I have missed someone, there are no Perone hives, either MK1 or 2, as designed by Oscar Perone (and I am not revering to the variants such as Phil Chandler's Dadant Perone type hive) working in the bee world connected to this forum. This is sad but also very interesting and the type of empirical data we need to judge this hive design. We have a potentially good swarming year this year to see if it can be done. No, there is still a Mk2 over here in France! It was mentioned in another thread. Transfer from a nuc early this year (did not expect them to survive the winter). Not a swarm as recommended but being totally unmanageable temperament wise it was the Perone or bee heaven. Did have brood so queen present. The entrance shows much increased activity with a lot of pollen being brought in and are now showing a very calm temperament. Will post a video if the warm temperatures continue. Thanks for reminding me, I did see your post before. You are now the measure for all the Perone try outs in the English speaking world! Unless someone else pops up as well. A few people have contacted me through my blog to let me know that they have Perone hives, too. I need to go back through my comments and reach out to those folks to encourage them to join this site. Off the top of my head, I remember one gentleman in the Washington/Oregon area (with a video on youtube of the bees coming and going near the entrance) and then a gentleman just recently contacted me from here in Maryland (near Baltimore) with TWO Perone hives that survived the winter. Thanks for reminding me, I did see your post before. You are now the measure for all the Perone try outs in the English speaking world! :) Unless someone else pops up as well. As of today me too! Here's a great video with Tel, who has several Perone hives in Oregon (or maybe it was Washington). About 4 minutes in he shows his Perone. Great video cheers CJ for sharing some very good points made in the video. Hopefully he will populate the Perone this year. That video was over a year old. I'm quite sure he has overwintered one or two, I think from a swarm. Last year a friend of mine hived a package of bees (1,75 kilo) in a Perone MkII hive and they are still going good. They filled about 2/3 of the broodbox with comb by september last year. I don't know what happened since then, but I'll probably hopefully see it next month. I really need to build one. I would love to go with you to see it. Posted: Mon May 18, 2015 6:25 pm Post subject: Prime Swarm moved in on their own! 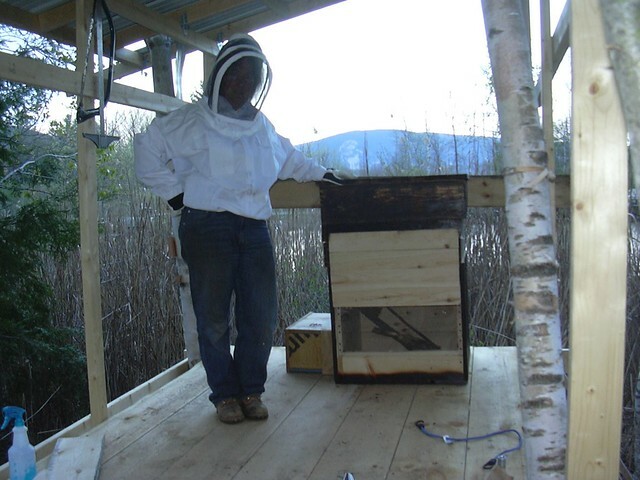 I am writing to let you know that, after one year of sitting empty, our Perone hive is now occupied once again. After our first try with two packages of commercial bees didn't make it through the winter, a prime swarm has now moved in all on their own! I couldn't be happier!!! I just snapped a few quick pics through the plexiglass windows but I promise to take more pics soon!!! That's fantastic, I'm glad you didn't give up and left the hive in place for a swarm to take up residence. Good luck with this group of bees. This is great. Did the comb survive ok in the hive while it was lying fallow? I would worry that it would be in bad shape after a year. My Perone was failing in early fall, I suspect the queen died. The population fell off and they stopped building new comb. Anyway, I bought a NUC this year and put it into conventional a Langstroth which I plan on managing like a Perone except that I'd like to be able to do splits. We had some cold weather after I got the NUC & I decided to open up the Perone. I got about 1.5 gallons of honey out of it. The new bees weren't interested in the Perone till I took that honey out and now there's lots of action. I would not be surprised if a swarm moves in. It does seem like it would be very difficult to harvest a full super of honey from the Perone - don't know if I could manage it by myself.